iGO My Way app can read out route directions in seven languages. 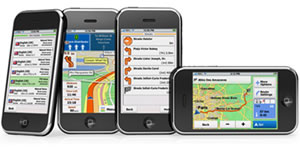 Loquendo TTS has been integrated into NNG's iGO My way navigation application for the iPhone. Once iPhone users have downloaded the app and started navigating with iGO My Way on their smartphones, following voice instructions becomes extremely easy with route directions that include street names and points of interest read out by Loquendo’s natural-sounding synthetic speech. The text-to-speech function is currently available in 12 regional versions of iGO My Way in the following languages: English, Spanish, Russian, French, German, Italian, and Portuguese. "NNG has created a quality navigation app with beautifully visualized 3D maps for rapid orientation," said Silvio Nasi, sales director for embedded technologies at Loquendo. "With each step of the journey read out by Loquendo's synthetic voices, the application is ideally suited for iPhone users on the move." iGO My way guides iPhone users to their destination with outstanding 3D graphics and clear visual cues and includes mobile features like searching points of interest and calling their phone contacts.